I love this, Sarah! Every word is perfect. Just curious–do you have slugs in England? They are all over the Northwest, and if I want to grow lettuce, I have to do it in containers on my deck. We do have slugs and snails, but our worst attackers on the allotment so far, have been little black beetles and mice. Fabulous – great work and that is a huge lettuce – add some tomatoes, some celery, sliced sun dried tomatoes, apple, a few chopped olives, capers, basil and mozzarella. Add whole grain mustard, olive oil and balsamic vinegar. EAT. It does, indeed. Until I started having some allotment veggie with my meals, I was beginning to find eating a bit of a chore. My son isn’t insisting on loads of gravy on his veggies now, either, as he actually likes the taste of them for once. I can’t look at the picture and read the poem without smiling. I love seeing children as part of the allotment team. 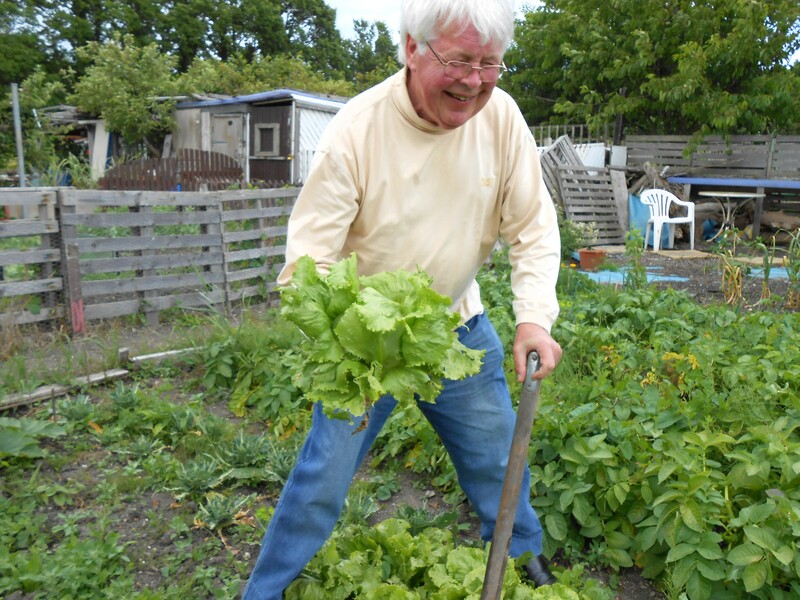 The people in the allotment next ours have two children, both of whom help out there. The teenage girl in particular, is most enthusiastic and can dig at an amazingly high speed, while managing to look totally trendy in the gear she wears!